The complete Victor recordings, including all known takes, as well as nine alternate takes from Williams’ Vocalion/Brunswick sessions not included on Retrieval RTR 79032. Stanley “Fess” Williams (cl,as,v) directing George Temple (t), David “Jelly” James (tb), Perry Smith (cl,ts,v), Henry “Hank” Duncan (p), Oliver “Ollie” Blackwell (bjo), Ralph Bedell (d). 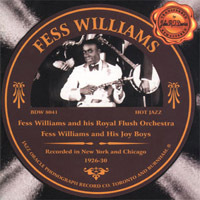 Stanley “Fess” Williams (v) accompanied by David “Jelly” James (tb), 2 unknown (as,ts), Otto Mikell (bar), Henry “Hank” Duncan (p), Clinton Walker (bb). One of the saxophonists also plays oboe. Stanley “Fess” Williams (cl,as,v) directing George Temple (t), Kenneth Roane (t,arr), David “Jelly” James (tb), Perry Smith (cl,ts), Otto Mikell (cl,as,bar,bsx), Henry “Hank” Duncan (p), Oliver “Ollie” Blackwell (bjo), Clinton Walker (bb), Ralph Bedell (d). Stanley “Fess” Williams (cl) directing “Fats” Robins (t,oboe), Reuben Reeves (t), Eddie Atkins-William Franklin (tb), Ralph Brown (as,oboe), Norval Morton (ts,f), Clarence Lee-Bobby Wall-Joe McCutchin (vln), Lawrence W. Dixon (bjo,vc), Sudie Reynaud (sb), Jasper Taylor (d). Stanley “Fess” Williams (cl,as,v,speech) directing George Temple (t), Kenneth Roane (t,arr), David “Jelly” James (tb), Lockwood Lewis (as), Perry Smith (cl,ts,speech), Felix Gregory (cl,as,ts), Henry “Hank” Duncan (p), Oliver “Ollie” Blackwell-Andy Pendleton (bjo), Emanuel Casamore (bb), Ralph Bedell (d). Ralph Brown-Felix Gregory (as) replace Lockwood Lewis. Stanley “Fess” Williams (cl,as,v) directing George Temple (t), John Brown (t,v), David “Jelly” James (tb), Ralph Brown-Felix Gregory (as), Perry Smith (cl,ts,v), Henry “Hank” Duncan (p), Oliver “Ollie” Blackwell or Andy Pendleton (bjo), Emanuel Casamore (bb), Ralph Bedell (d,v). Bobby Holmes (cl,as) replaces Gregory or Brown. Stanley “Fess” Williams (cl,as,v) directing George Temple-John Brown (t), David “Jelly” James (tb), Bobby Holmes (cl,as), Ralph Brown or Felix Gregory (as), Perry Smith (cl,ts), Henry “Hank” Duncan (p), Oliver “Ollie” Blackwell or Andy Pendleton (bjo), Emanuel Casamore (bb), Ralph Bedell (d), Frank Marvin (v). Emanuel Clark (t) replaces Temple; Walter “Fats” Pichon replaces Duncan; one of the reedmen omitted. Stanley “Fess” Williams (cl,as,v) directing George Temple (t), Kenneth Roane (t,arr), David “Jelly” James (tb), Perry Smith (cl,ts), Gene Mikell (cl,as,bar,bsx), Henry “Hank” Duncan (p), Oliver “Ollie” Blackwell (bjo), Clinton Walker (bb), Ralph Bedell (d). Stanley “Fess” Williams (cl,as,v) directing George Temple (t), Kenneth Roane (t,arr), David “Jelly” James (tb), Lockwood Lewis (as), Perry Smith (cl,ts), Felix Gregory (cl,as,ts), Henry “Hank” Duncan (p), Oliver “Ollie” Blackwell-Andy Pendleton (bjo), Emanuel Casamore (bb), Ralph Bedell (d). Stanley “Fess” Williams (cl,as,v) directing George Temple-John Brown (t), David “Jelly” James (tb), Bobby Holmes (cl,as), Ralph Brown or Felix Gregory (as), Perry Smith (cl,ts), Henry “Hank” Duncan (p), Oliver “Ollie” Blackwell or Andy Pendleton (bjo), Emanuel Casamore (bb), Ralph Bedell (d).